The National Marine Fisheries Service (NMFS) announced on January 13th, 2017, that it will consider a whale protection zone that will reduce noise and vessel disturbance of endangered southern resident killer whales. This population of killer whales has declined severely with only 78 whales remaining. The scientific petition seeks to protect core foraging habitat for the killer whales by reducing vessel disturbance. The key threats to killer whales include prey limitation, noise and pollution. The Proposed Rule has been published in the Federal Register and opened for public comment during a 90-day period through the Administrative Procedure Act process. To see more details and submit your own comments please click here. Comments in support of a Whale Protection Zone are needed now more than ever! In 2009, the NMFS imposed a 200-yard approach rule and prohibition on parking vessels within the path of the whales, which was finalized in 2011. In November 2016, Orca Relief Citizens’ Alliance, Center for Biological Diversity, and Project SeaWolf submitted the formal Regulatory Petition to NMFS requesting that the agency use it’s authority to establish a Whale Protection Zone (WPZ) in effort to expedite recovery of the endangered Southern Resident Killer Whales (SRKW). The Southern Residents, which often frequent the southern Salish Sea, are listed as an endangered population under the Endangered Species Act and a depleted population under the Marine Mammal Protection Act. It is under these Acts that Orca Relief and partners called on the NMFS to exercise their authority. The SRKW population is currently at an alarming 78 individuals. In October 2016, the death of J-28 (Female, 1993) was confirmed, and her calf J-54 (Male, 2015) has not been seen since. After Orca Relief’s filing of the Regulatory Petition, J-34 (Male, 1988) and J-2 (Female, 1911) were both confirmed deceased. The Southern Resident population is threatened primarily by lack of food due to declining Chinook salmon runs; toxic pollution and other contaminants; climate change; noise and disturbance. The Whale Protection Zone would give the population more quiet time for hunting, communications, and rest. “I have a sinking feeling because so many orcas died this past year because they’re so seriously close to extinction. We need to use everything possible to safeguard the last 78 whales, and a whale protection zone will protect them from noise and other disturbances,” said Miyoko Sakashita, oceans program director for the Center for Biological Diversity. NOAA’s decision to publish the Regulatory Petition within the Federal Register, for public comment, is an optimistic step in the effort to safeguard the SRKW population. Without these concrete steps being taken, the SRKW population face an acute risk of extinction. The whales are dying. Since 2005, we have lost about 12% of the endangered Puget Sound/ Salish Sea Orca population. The 78 whales of J, K, and L pods are the smallest population since 1985 (NMFS data). 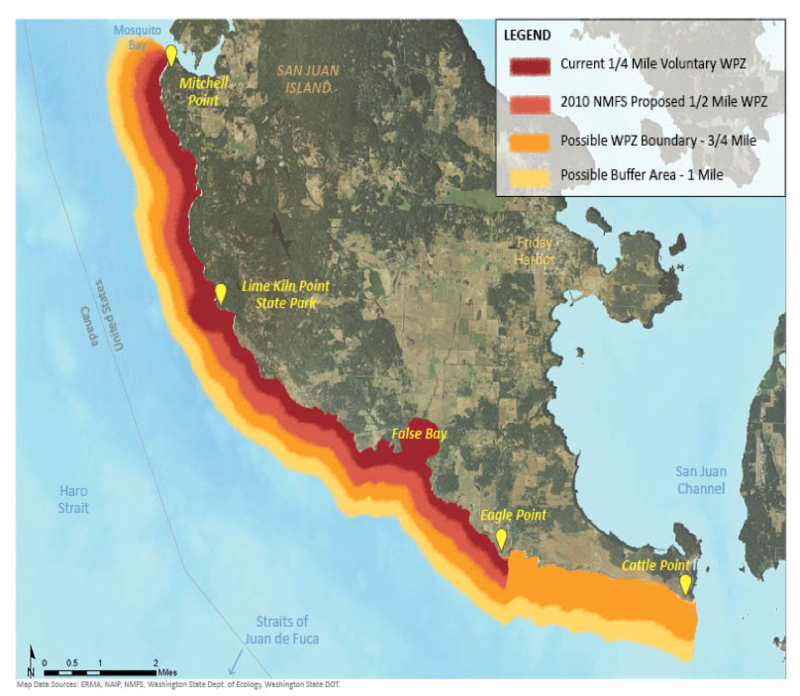 To prevent further harm and to begin the recovery of this endangered species, Orca Relief calls on NMFS to rapidly begin the regulatory process needed to establish a Whale Protection Zone on the West Side of San Juan Island, Washington. Help us build a Coalition that will work with NMFS and other interested parties to determine the best approach to design, management, and enforcement of the Orca Whale Protection Zone.